Like you, your pooch can suffer from toothaches. 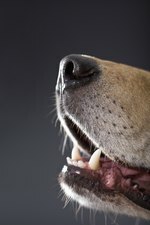 Although dogs get cavities less often than humans, a buildup of tartar along the gum line can cause the gums to recede. As a result, dogs can develop periodontal infections in their carnassial teeth that lead to the formation of abscesses, which are pus pockets under the gum line. This painful condition can cause serious illness if it is left untreated. Dogs can develop periodontal infections. Although any tooth is susceptible to dental problems, the fourth premolar or carnassial tooth can cause your pup the most problems because of its size. This tooth is found on the upper jaw. It is larger than the other teeth and has three roots instead of just one. Wild dogs use this tooth to tear up large chunks of meat or bone. Pet Education explains that a carnassial tooth infection usually affects the roots of the teeth rather than the exposed area. 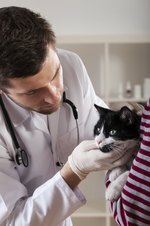 Symptoms indicating your pet may have an abscess include bad breath, facial swelling, and a leakage of pus that breaks through the skin of the face or mouth. Additional symptoms include tooth discoloration, oral bleeding and an unwillingness to eat or chew anything crunchy or hard. If the infection is caused by trauma to the mouth, a broken or damaged tooth may also be visible. Your pup may also rub at his face or chew only on one side of his mouth. According to Pet Health and Care, abscesses are often caused by a bacterial infection in the body such as streptococcus or E. coli. The bacteria infects the root and cuts off the blood connection. This destroys the tissue around the tooth and the tooth becomes loose. The body reacts to the invasion of bacteria by amassing white blood cells, which leads to the formation of pus. A veterinarian can diagnose abscesses or infected teeth by conducting a physical examination and a blood test. Fido may also need X-rays to determine which tooth or teeth are infected. He may need to be anesthetized to complete the examination and treatment, particularly if he is in a great deal of pain. The doctor will drain the pus or fluid that surrounds the infected tooth. This will relieve the pressure on the root and drain the infection out of the body. The tooth is usually extracted by cutting it in half then pulling it out. The infected tissue may need to be removed as well to prevent reinfection. The tooth can also be treated with a root canal, but Pet Health and Care indicates that this process is expensive. Your pup will need to stay on antibiotics for some time after the extraction or root canal is complete to eradicate any traces of infection.